In love with Formula 1: Bahrain GP: Fifth win in-a-row for Rosberg! Bahrain GP took a dramatic turn even before it actually got started. Suddenly on the warm-up lap smoke started coming from the rear of Sebastian´s SF16-H without any warning! I couldn´t believe my eyes, I didn´t want to believe it was true! 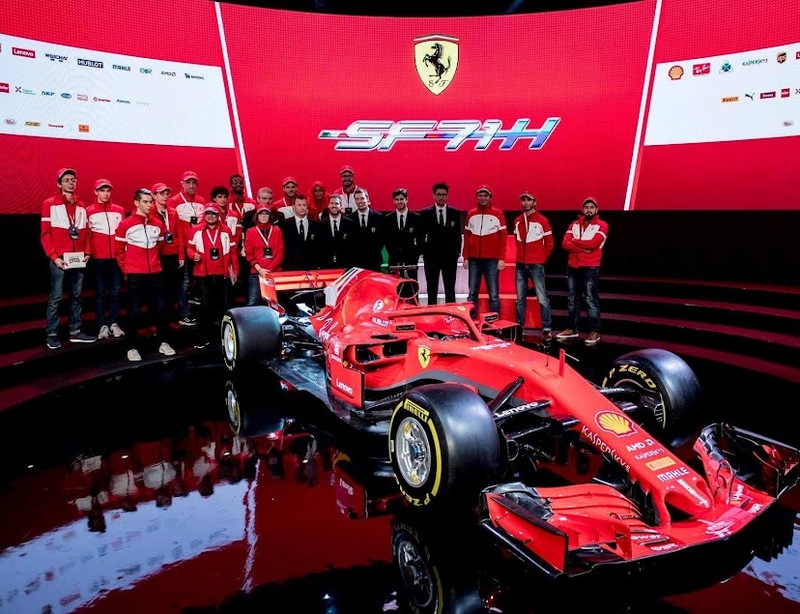 Sebastian´s race was over before it even got started :( In the season-opening Australian GP it was Kimi´s car, which got hit by a technical failure and today it was Sebastian´s turn to face a DNF. Reliability seems to be a real issue for Ferrari this season. I can´t even describe my feelings, how heart-rending to see Sebastian being out of the race already before the start! The start was eventful, too. Kimi had a poor start for some reason and lost instantly many positions. The Williams of Massa and Bottas on the other hand got superb starts and they were challenging the Mercedes duo going into Turn 1! Rosberg got a dream start and took the lead but Bottas in his FW38 was already alongside Hamilton going into the first corner. They ended up colliding, which caused some damage on Hamilton´s car. The Briton lost many positions but was able to continue racing in spite of the collision. The collision was taken under investigation by the stewards a bit later and Bottas was considered to be at fault. The Finnish Williams driver was handed a drive-through penalty, which destroyed the Finn´s race pretty much. So on lap two Rosberg was leading the race, Massa was second and his teammate Bottas third. Kimi was fifth and Hamilton was down in P7. Kimi was absolutely passionate to make it another podium finish in the darkening night of Bahrain. On lap 6 he was right at Ricciardo´s tail. The Australian went wide and the Iceman used his opportunity and made a dashing overtaking move on the Red Bull pilot. A lap later the Iceman had caught his fellow compatriot Bottas and made another stunning overtaking move! Luckily this time there was no contact between the Finns (we all remember those two collisions between the Finns from last year). Massa in his Williams pitted from P2 for a fresh set of medium tyres, which made Kimi jump to P2. The gap to the race leader Rosberg, however, was already 14 seconds. But Kimi seemed to be in flames on track today -and this time only figuratively, not literally like in Australia! Also Bottas pitted for a fresh set of medium tyres. Williams´ tyre strategy differed clearly from other teams´ strategies. Kimi pitted on lap 13 and his choice was the yellow-marked soft compound. He rejoined the track right behind Massa and Ricciardo. Again we saw very aggressive and determined Kimi, who made his way first past Massa and then past Ricciardo in an easy-looking way. The Mercedes duo pitted as well: Rosberg had a similar tyre choice to Kimi´s but Hamilton opted for a fresh set of medium tyres. It certainly seemed that there was an interesting race evolving... Kimi made his way past Red Bull´s Kvyat as well and the Iceman took back his second place. Kimi started setting fastest lap times one by one. What a pleasure it was to watch Kimi´s race! There really is something magical about Kimi and Bahrain! At the same time Grosjean in his Haas was driving a dream race for the newcomer team. The Frenchman was already challenging Ricciardo for P4 and Grosjean made it past the Australian! Haas´ performance was very impressive, they really have some serious pace! After the second pit stops the top three had a similar tyre choice: both Mercedes drivers had the yellow-marked super soft compound, so did Kimi. Rosberg was still leading the race with Kimi second and Hamilton third. There were solid gaps between those three so no real battle for the positions. Ferrari made the genius choice to call Kimi into the pits before the Mercedes duo for his third and last pit stop. Yellow-marked soft tyres was the Iceman´s choice for the last stint. Immediately after the pit stop Kimi started nailing it with purple sectors. Mercedes reacted immediately by taking Rosberg in for his third pit stop. The German also rejoined the track on the soft compound. Kimi benefitted from the undercut and was just a few seconds behind Rosberg. I could actually imagine how the Iceman was able to smell Rosberg´s blood and wanted to attack on the German! Hamilton pitted a few laps later also for a fresh set of soft tyres. The Briton was already over 10 seconds down on the Iceman though. Rosberg cruised to victory under the shining lights of Sakhir and made it his fifth victory in-a-row, which is quite impressive. Rosberg has definitely got a dream start to this season and has a convincing lead in the drivers´ championship standings. Kimi continued his Bahrain magic by making it already his 8th podium finish at Sakhir! In spite of the small gap to Rosberg after the last pit stop Kimi was unfortunately unable to take the battle to the German. Hamilton completed the podium. Behind these top three Ricciardo finished 4th and what was even more stunning, Grosjean took 5th for Haas! 6th place in Australia and now 5th in Bahrain shows that Haas have a lot of potential in their car. Verstappen drove to the chequered flag in P6, which made me quite happy, too. Kvyat in his RB12 finished 7th ahead of the Williams duo Massa and Bottas. McLaren´s Vandoorne, who drove his F1 debut today, completed the top ten, which was an absolutely excellent achievement for the young Belgian! Very impressive indeed. Rosberg has now the maximum 50 points in the championship standings. His teammate Hamilton is second with 33 points and Ricciardo third with 24 points. Kimi and Grosjean share the 4th place with 18 points and Sebastian is in P6 with 15 points. In the constructors´ standings the situation is quite crushing: Mercedes have 83 points to Ferrari´s 33. Ferrari are paying a huge price for their reliability issues, which they definitely can´t afford! And what definitely catches my eye is the fact that the newcomer Haas are in P5 with 18 points, which is utterly impressive. The F1 circus moves to China in a fortnight. Hopefully Ferrari will be able to fix their reliability issues by the Chinese GP! But no matter what happens in China, technical failures or not, I always keep my fingers crossed for Kimi and Sebastian and hope the very best for them!